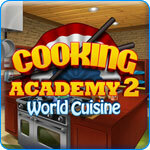 Cooking Academy 2: World Cuisine Game - Download and Play Free Version! This game is your own kitchen with none of the mess! Cooking leaders from eight countries will personally show you how to cook 60 different dishes as practice for your cooking exams. The winner receives one million dollars to start their own restaurant! 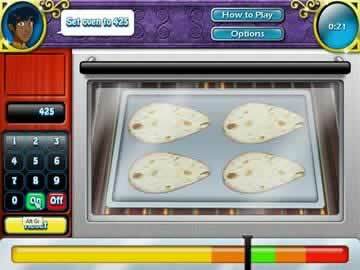 Cook by completing numerous cooking-themed mini games. Dice up garlic for crab rangoons by clicking on a knife and raid the refrigerator to find ingredients for lettuce wraps by searching for hidden objects. The kitchen is at your fingertips as you're asked to do everything from washing vegetables to juicing limes to filling donuts. 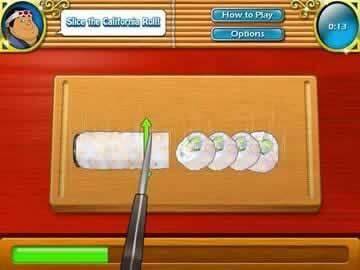 Each mini game teaches you something about cooking, such as learning how to fold fortune cookies. The mouth-watering graphics will leave you craving irresistible dishes ranging from mundane corn on the cob to exotic chicken pad Thai and tiramisu. But watch the clock or you'll lose points! Learn how different ethnic foods are traditionally served and where they originated. Use and recognize various ingredients popular in different countries. Maybe you'll even be inspired to do a little real cooking of your own! Craving Italian food tonight? Get cooking that and more with Cooking Academy 2! See an assortment of the actions which you can perform as the head cook, such as frying, cooking, and raiding the fridge for ingredients.